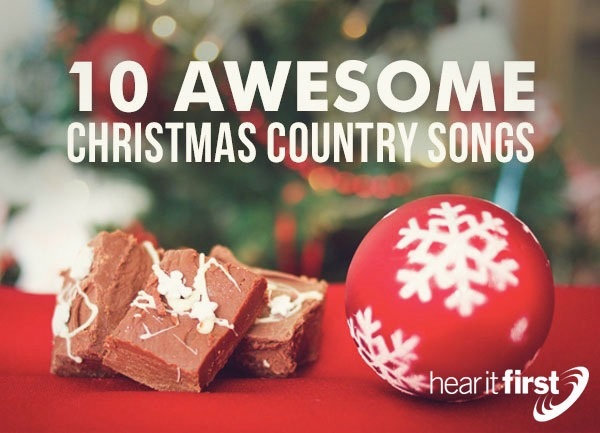 Here are ten awesome Christmas country songs that you and your family are sure to enjoy. The song, Rudolph the Red-Nosed Reindeer, by Gene Autry, is a very old song, but has been ranked number one overall in country music as far as Christmas songs go. This song was written in 1939 by Robert L. May, a copywriter for the Chicago-based Montgomery Ward department stores, as he was writing it for promotional purposes. It has been a children’s favorite ever since…now, for over 75 years. The song names all of the reindeer pulling Santa’s sleigh, and lists them off; “You know Dasher and Dancer and Prancer and Vixen, Comet and Cupid and Donner and Blitzen, But do you recall. The most famous reindeer of all?” Of course, Rudolph the red-nosed reindeer is the most famous of them all. Gene Autry's recording sold 1.75 million copies in its very first Christmas season, but eventually is sold a total of 12.5 million, and is still being sold today. This song is also part of the 1964 CBS TV special, Rudolph the Red-Nosed Reindeer, and it still remains the longest-running holiday special in TV history. The song, O Holy Night, sung by Martina McBride, is one most of the moving Christmas songs of all time. It’s found in the top five lists of most popular country Christmas song rankings, and for good reason. You can sing this around the Christmas tree or in a church Christmas service. In this very biblical song, Martina sings about a most “holy night” where “The stars are brightly shining. It is the night of our dear savior's birth,” and in giving God the glory and praise for His Son, she sings, “O hear the angel voices. O night divine. O night when Christ was born. O night divine.” This is the very essence and meaning of Christmas, where God came to be born of a virgin and dwell in the flesh, to redeem those in the flesh (John 1:14). The song, Rockin’ Around the Christmas Tree, sung by Brenda Lee, is another “favorite five” on most country music Christmas in ranking the all-time favorites. This song is very upbeat and creates great atmosphere, perfect for a Christmas party at work. The beat is just too much too ignore as Brenda Lee will put you in the Christmas spirit in quick fashion, singing, “Rocking around the Christmas Tree. Let the Christmas Spirit ring. Later we'll have some pumpkin pie. And we'll do some caroling,” so “Have a happy holiday. Everyone's dancing merrily. In a new old fashioned way.” Doesn’t that make you want to “rock” around the Christmas tree? The song, Winter Wonderland, performed by Brooks and Dunn, is raw, traditional country in its purest form, and their rendition of the Holiday classic is up-tempo enough to dance around the Christmas tree with Brenda Lee. This song may have a lot more meaning for those who live in the north, where they sometimes see snowfall. It’s easier to appreciate seeing snow and observing, the “Snow is glistening. A beautiful sight. We're happy tonight. Walking in a winter wonderland.” I must admit, having snow during Christmas makes it “A beautiful sight,” so “We're happy tonight…Walking in a winter wonderland,” and being from Sharon, Kansas, she has probably seen her fair share of snow in the winter. The song, White Christmas, as done by Martina McBride, once again proves that Christmas country music is very near to her heart. Once more, Martina brings up many cherished memories, as if they were from her own childhood; and maybe they are. The country flavor of her version of White Christmas, makes you want to say, “Let it snow, let it snow, let it snow.” It’s as if she sings from a child’s point of view, “I'm dreaming of a white Christmas. Just like the one's I used to know” and “Where the tree tops glisten and children listen. To hear sleigh bells in the snow” and of course, with the sound effects and lyrics, it’s as if you’re riding in the sleigh with her. The song, I’ll Be Home for Christmas, sung by Joe Nichols, sounds like a long anticipated return home for the holidays, as he sings, “I'll be home for Christmas. You can count on me. Please have snow and mistletoe. And presents under the tree,” and “Christmas Eve will find me. Where the love light gleams,” but in case he can’t make it, “I'll be home for Christmas. If only in my dreams.” It’s a bit of a mix of jazz, piano, and traditional country in mid-tempo, making it easy, and in fact, a delight to dance to during the Christmas holiday. Vince Vance and the Valiants’ version of All I Want For Christmas is You, is a beautiful version of this classic Christmas song, but done in the country genre. Back in 1989, this song was the most played Christmas song of all (1989), and it still appears on the country music charts even into the 2000’s during the holiday season. If you’ve heard it, you might understand why. It’s sort of a melancholy Christmas song about losing the one they love. They sing, “Take back the holly and mistletoe. Silver bells on strings. If I wrote a letter to Santa Claus. I would ask for just one thing…Cause all I want for Christmas is you.” This is a very familiar Christmas song that makes it easy to do a sing-along. Grandma Got Run Over by a Reindeer was written by Randy Brooks, but the song was originally performed by the husband-and-wife duo of Elmo and Patsy Trigg. today, it’s still been sung by dozens of different authors in many different styles, but Elmo and Patsy’s version is the most familiar version of all and is considered a country music Christmas classic. It was actually written just as a novelty idea, and not with the intention of making it skyrocket up the charts, which it has for decades during the holidays. In this humorous song, it’s right after grandma gets run over by a reindeer, that “all the family's dressed in black,” while the widower acts as if nothing's happened, drinks beer, watches football and plays “cards with cousin Mel.” The last bit of advice is a warning for us to watch out for “a man who drives a sleigh and plays with elves,” because you might next to get run over. The late Country Music Hall of Famer singer and songwriter, Merle Haggard, has a place in country music history, but his iconic holiday song, If We Make it Through December, is one of the most familiar and most loved of all of the Christmas country songs. The “working-man’s” country music singer, Merle Haggard, often uses the themes of unemployment and loneliness as a backdrop for his songs, and that became one of his greatest trademarks during in his entire career. Singing of this financial hardship, he sings, “If we make it through December, Everything’s gonna be all right,” and “I know it’s the coldest time of winter,” but we’ve “Got plans to be in a warmer town come summertime.” This song gives the listener hope. The timing of the release, during the Christmas season, made this an instant classic Christmas country song, where it has remained until today. Are there songs that you would have included? If so, which ones would those be? Why would you want it to be considered a Christmas country classic? There are so many that we could have selected, like Alabama’s, Christmas in Dixie; Elvis Presley’s, Blue Christmas; Dolly Parton’s, Hard Candy Christmas; Born on Christmas Day, by Brad Paisley; Kenny Roger’s, Mary Did You Know?” and literally hundreds of others. That’s because there are so many Christmas country songs favorites, that we couldn’t possibly name them all in one article.